A young Al Cherne listens intently to the advice of his father, Tony. Starting full time in 1949, Al Cherne brought a new enthusiasm to the family business and a desire to move away from plumbing and heating jobs toward larger industrial projects. Tony Cherne, then 60 years old, resisted this redirection but in time yielded to Al's persistence and granted Al permission to bid the mechanical work for the Cliffs Power Company's new 7.5 megawatt power plant in Ishpeming, Michigan. 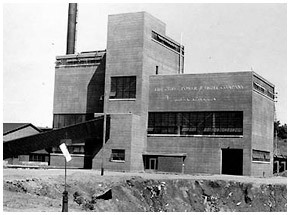 The Cleveland Cliffs Power Station, constructed in 1949 in Ishpeming, Michigan, was Cherne's entry into the heavy industrial construction market. Al Cherne knew he had entered the "Big Time" world of industrial construction when he received notice that The Cherne Company had been awarded the contract. What Al didn't know was that his bid was 40 percent below the second bidder! Stunned by this news and the possibility that he had bankrupted the company and his father, Al concluded that he would have to live on the job and ride herd on every detail to minimize the losses. Al Cherne was on that job every possible minute, working virtually round-the-clock. As he recalled some years later, "After dinner each evening I spread the blueprints on the table. I had that job memorized. I figured the only way to come out of this was to get two days work done every day. I just had to. I short cut everything. I had every tool available for the men. If a guy was looking for a wrench, I'd be right there to hand it to him." This 1949 photograph taken at the Cleveland Cliffs Power Station in Ishpeming, Michigan shows two package boiler units being set in position. The superstructure of the power station would eventually be built around the boilers. He was learning the hard way, but when the job was finished Al had a great sense of accomplishment and confidence. "I'll always remember one of the men, a big man, Louie Bouchard from Escanaba, Michigan," said Al. "After the job was done he started to cry when I wrote his check. I asked, ‘Louie, what's going on?' He said, ‘Mr. Cherne, I've been on a lot of jobs and I've never worked so hard in my life and liked it so much. I hate to see it end.' "
The Cliffs Power project taught Al that the job-site hands would give the company a productive day's work for a day's pay if management gave them the tools, materials, drawings and proper planning they needed to be productive. The work planning processes developed by Al Cherne at the Cliffs Power project, refined by 50 years of experience, form the basis of Cherne's current work execution procedures. Cherne performed numerous commercial and governmental plumbing projects in the early years. 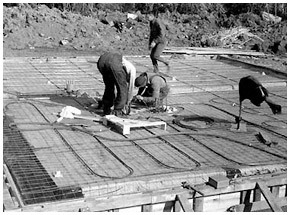 This photograph from 1952 shows plumbers installing radiant floor heating coils on a troop housing project. The Cliffs Power project turned out to be a winner with Al making twice the profit included in the bid. The early 1950s brought larger industrial construction opportunities at Lake Superior Power Company's Bay Front Station in Ashland, Wisconsin, Reserve Mining Company's huge taconite project in Silver Bay, Minnesota, and White Pine, Michigan's copper mine complex. The steady growth of the Cherne Company, bolstered by White Pine and Silver Bay, was followed by a series of major powerhouses, locks and dams, cement plants and paper mills. 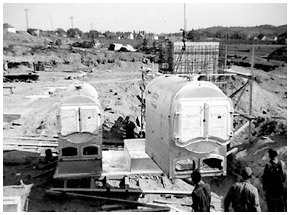 In 1956 an association began with Dow Chemical when Cherne was awarded the mechanical work for a depropanizer and C3 splitter plant in Midland, Michigan. This would lead to several contracts with Dow over the next eight years accounting for more than 20 percent of the company's volume during this period. 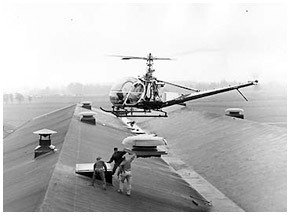 Cherne demonstrated its entrepreneurial spirit in 1962 as one of the earliest users of the fabled 'skyhook.' In little more than two hours Cherne set 34 roof ventilators weighing 625 pounds each on the roof of the Ravenna, Ohio Flintkote plant. 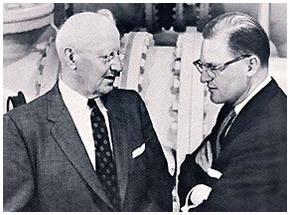 In 1957 Al Cherne became president and took over leadership of the fast growing company. In less than ten years the company had completed a major step by moving into the heavy industrial arena, just where Al Cherne wanted to be. He was 33 years old and was now working in six states with volume exceeding $2 million. By 1961 he had acquired his father's stock and began operating under the name Cherne Contracting Corporation.